I am interested to hear more abut the Falcon/Winter Soldier mini-series coming to the Disney streaming service. I enjoyed their brief interaction in Captain America: Winter Soldier, and it will be fun to see that relationship expanded upon. I'm hoping for a classic Marvel villain or two to make an appearance - this seems like the perfect place to use some of the b-list bad guys that might not make it to the big screen. This was a true Kirby klassic from the 70s. Wonder what Jack would have thought of some of your versions with the computers of today giving such fun assists. @Ross: You mean, like that Zzzax rip-off, the Blip (one of whose electromagnetic kin seems to be on your cover)? 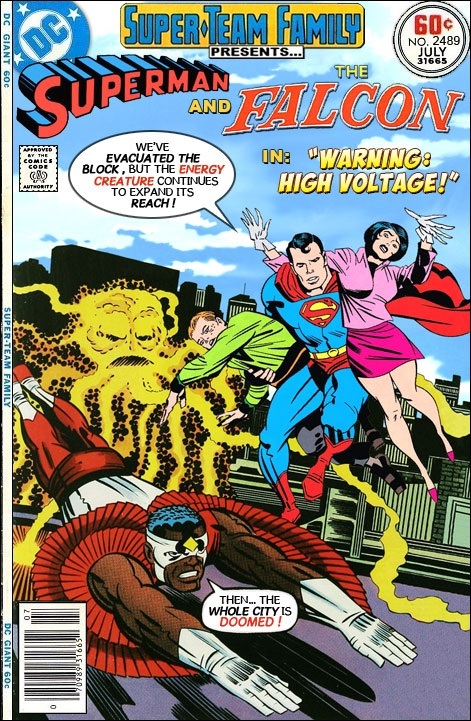 Superman is one of very few characters who Kirby could not draw effectively. The Black Winged Superhero From MEGO! Have an Issue where only Characters that were MEGO Action Figures are on it. The Team From M.E.G.O. I remember a newswoman for Entertainment Tonight who once interviewed Jack Kirby. He drew a picture of himself, dressed as Superman, rescuing her in mid-air. And she laughed at how flatteringly he over-endowed her! DC never liked Jack's version of Kal El's Chest Shield, they always had somebody redo it. But IDK who it was that redid it? Murphy Anderson redrew Kirby's Superman. Speaking of Jack Kirby, is the Silver Spider (the prospective superhero created by his ex-partner Joe Simon) still the intellectual property of Harvey Comics? Or has it long since become public domain? @Cary Comic I never heard or knew there was a The Silver Spider. Please share with the class the "deets" as the kids in the previous decade used to say. No really I mean it. I apologize for being serious, but you caught me off guard. The way I've read it, at various sources, Joe Simon created the Silver Spider for Golden Age Harvey Comics. They rejected it. So, he revamped the concept. Instead of a kid whose magic ring transforms him into a blond-haired guy in silvery-white clothes, armed with a web-shooting gun, he becomes a masked crime-fighter dressed in green-and-gold who can wall-crawl like a fly. He offers the concept to MLJ--WWII predecessor of Archie Comics--and thus is born...Fly Man! Almost 20 years later (circa 1963), Marvel Comics' sci-fi anthology book "Amazing Fantasy" is going to be discontinued with Issue #15. Stan Lee asks Jack Kirby for something that will basically (to use modern parlance) jump the shark. A teenage superhero who's his own guy, right from the start. No side-kicking, whatsoever! Stan Lee reportedly liked everything except the magic ring, the web gun, and the lack of a hyphen. So, the job of illustrating what Stan had in mind went to Steve Ditko. And the rest...is history. @Cary Comic A Stan & His-hyphens shall never part. I would like to know more about the character the Silver Spider and his adventures though. @Cary Comic is the Silver Spider that infamous "Spider-Man" costume that many a mom ignorantly purchased for her son for Halloween, and the mask famously worn by Steve "The Joker" Miller? Some People call me The Space Cowboy, some call me The Gangster of Love, Some People call me Maurice because I speak of the Pompatus of love. Done Dirt Cheap! I just noticed the tittle. I don't think the Silver Spider ever went beyond the initial pencil-drawn concept art. You can see an on-line reproduction of it at the website called "The Mighty Crusaders Network" which gives a wonderfully detailed history of the MLJ heroes from WWII, through the campy Sixties and action-packed Eighties, on up to the DC Impact and Red Circle experiments. As for the cover "tittle" (sic) in question? "We're encased in a gigantic geodesic glass bowl !" - Superman. Then the whole city is Domed!- The Mego Black Winged Super Hero The Falcon! @Cary Comic watch your step LEGOS on the floor. @Cary Comic From what I read Silver Spider in the immortal words of Red Buttons (to turn a phrase), "...Nevah got a dinnah." - Red Buttons. No adventures to be found for Ol' Silver Spider. Like I said: it never went beyond Joe Simon's artistic pitch to Harvey Comics. Which is why I originally asked if anybody else might know whether or not that makes the Silver Spider public domain! Why does more get to be the Pity?